Calderdale Council’s director of public health says there has been a 30% reduction in road casualties in the three years since the introduction of a wide area 20mph limit in the West Yorkshire district. Paul Butcher announced the casualty reduction statistics at a council committee meeting on 26 April, adding that on the roads most recently introduced to the 20mph scheme, casualties could fall by around 40%. Mr Butcher’s report also revealed a 1.9mph fall in the average speed on roads with a 20mph limit, based on 3.5m vehicle speed checks. The intervention is described as ‘cost effective’, with the casualty reductions estimated to have delivered a saving to the public purse of around £3m – more than three times greater than the total investment of £821k. Calderdale Council says there is ‘continuing public support’ for 20mph, with recent surveys showing more than 80% support in the towns of Todmorden and Sowerby Bridge. The campaign group 20s Plenty for us has congratulated Paul Butcher and his colleagues at Calderdale Council, describing the town’s ‘popular and well coordinated’ 20mph scheme as a ‘triumph of safer community streets’. 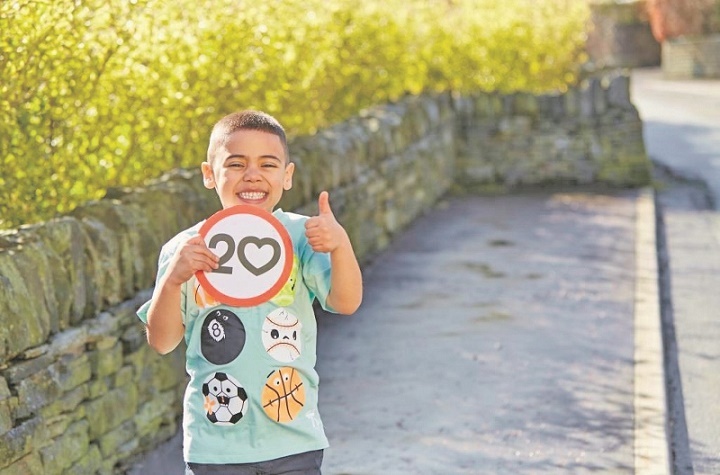 Rod King MBE, founder and campaign director of 20’s Plenty for Us, said: “Calderdale’s public health and transport team makes a real difference to implementing 20mph. “When we go beyond traffic management and seek to empower people to change their driving behaviour for the good of the community then everyone wins especially those unnamed people who do not end up as casualties on our roads. “This success is being reflected in other places such as Bristol where four fewer fatalities per year are estimated from 20mph limits. It’s clear that the UK’s national 30mph limit, with more than 100,000 casualties per annum, is no longer fit for purpose. I have made enquiries of the West Yorkshire Police, Calderdale District and indeed I was right that a lot of time and effort has been put into the policing of this scheme. Wherever there has been a complaint they have responded accordingly. They have also supported this scheme onto the main arterial roads where the more normal speed limit of 30 and 40 mph applies and this is maybe the reason that I found such a dramatic reduction of collision on those main roads. Isn’t the reason why casualties are falling – anywhere… is er… less collisions?? To the comment “that is does not really matter why casualties are falling”, I disagree entirely. It is essential we know the likely reasons as we would then do more of it. Equally we should do less of what does not work. I commend Calderdale Council for a successful 20s scheme however I note that the “triumph of safer community streets” is 20s Plenty hype and such sensationalist comments are not to be found in the Council’s report, which is altogether more balanced. The report to Council does indeed say that there is majority support for 20mph speed limits in Calderdale but immediately goes on to say there remains concern about compliance and behaviour of other drivers (section 5). Community feedback includes concerns about an increase in aggressive driving (section 2.4). And of course there are a number of roads where actual vehicle speeds have increased when the 30mph speed limit has been reduced to 20mph. Most 20s reports fail to mention if there are any other, often separately funded, initiatives that may be happening in parallel in the same town e.g. active travel promotions, cycle training promotions etc. If there are, whether any of those may have contributed to the casualty reduction. A 30% reduction in casualties over 3 years is great news, no mistake, although it would have been more helpful if the baseline trend %age reduction of “doing nothing” was also mentioned for comparison purposes. The Council themselves say that education and engagement needs to be maintained to encourage drivers to think of 20mph as the norm – that is a work in progress. I have absolutely no sympathy with anyone caught speeding be it in a 20 mph area or anything above. Understanding that our speedometers register a higher speed than that which we are actually doing then if someone is reported for speeding at say 35 mph [ by an accurate device] its odds on their speedometer would have been showing something like 10% above that speed and so it would read about 38/9 mph . If one cannot see the difference then at that speed in a 30 mph area they deserve what they get. If they had worn out tyres its more than likely their speedometer would have recorded more speed, about 40 mph. plus. So they have no excuse do they or sympathy. “It’s time to set a national 20mph limit for urban/village roads and let local authorities decide the exceptions.” Quite right and in an ideal world it would be done properly and intelligently, but in my experience locally, the authorities make a pig’s ear of deciding the exemptions and unfortunately this is always going to be the weak link in implementing 20 speed limits. e.g. 20 to 30, then back to 20 again…all in the same suburban road, with uniform characteristics why ??? I’m all for speed limit enforcement, but in cases like these, I would actually sympathise with an offender caught. It doesn’t tell the whole story. Within the Calderdale area some areas have suffered far more of a decrease in collisions but many have seen less of a decrease and some non at all?. They have therefore taken an average but it still seems an unbelievable reduction? That said it does appear to be good news and one that the 20 is plenty scheme need to justify all their efforts and also that of the Council who decided to make the decision to go 20. However on closer examination looking at the stats on CRASHMAPS and making year by year comparisons within particular busy road areas within Calderdale one will find no marked difference in the numbers of collisions in residential areas that have been reduced to 20 mph. What I have found is quite a dramatic difference in the numbers of collisions on the main A roads and busy routes throughout Calderdale. This is probably because the Local Police have been quite pro active in their presence and have also been prolific in their use of hand held speed cameras aimed primarily on the main arterial roads and so the numbers claimed look to be good for the 20 is plenty scheme these reductions do refer in the main to a pro active police force out to prevent speeding in the 30 plus mph roads systems throughout the Calderdale area. I cannot say that it may also be because of the implementation of ASC in some areas but that is occurring throughout GB at this moment in time. It then may be possible that as more of these ASC become prominent on our main Highways that speeding will be reduced and to some degree crashes will be avoided. I look forward to those times. However it doesn’t really matter what has caused the dramatic reduction in collisions. That has still to be applauded.